We have known for some time that British Airways is moving at speed to add even more seats to its short-haul Airbus fleet. The exact details are only starting to emerge now as cabin crew are sent for retraining. A few weeks I reported how duty free is being dropped from British Airways short-haul flights. This is because a rear toilet in Euro Traveller (economy) is being removed to fit in more seats, and replaced by a loo built into the back wall of the galley. The loo will take up part of the space formerly occupied by the duty free trolley. The Club Europe loo at the front remains. The first twelve rows of seating (A320) or fourteen rows (A321) will retain the current seats. USB and standard power sockets will be added. 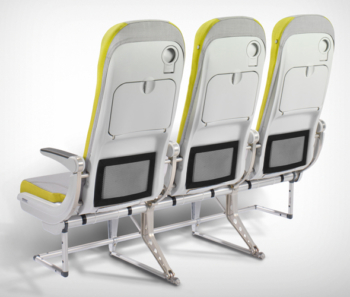 Seats in the rest of the aircraft will be replaced by ultra-thin seats with a 29 inch pitch. From March, there will be a substantial benefit in being seated in the first 12 or 14 rows. The ultra-thin seats will have USB sockets but no standard plugs. Sales of Club Europe tickets will be capped on longer flights as there will no longer be enough galley space to store meal trays beyond a certain point. This is not an issue on shorter flights as the meal is served on one tray. The new aircraft being received by BA from March will not have drop down monitors. This means that cabin crew will do manual safety demonstrations and there will be no ‘moving map’ to watch. This is a fuel saving measure due to weight. There will be no waste facilities or potable water supply at the rear of the plane, again due to the need to free up space to fit in the loo. This means that all waste will be carried through Club Europe for disposal at the front, and all requests for free tap water will require a trip to the Club Europe galley. Very little of this is enticing, but apparently we only have ourselves to blame for refusing to spend 1p more than a low cost carrier for our flights. Even though BA will always cost 1p more than a low cost carrier due to the £19.30 per person Heathrow Passenger Service Charge ….. There are two more cheerful bits of BA short haul news. The Qatar Airways planes are coming back! There is a rumour that six Qatar Airways short haul aircraft will be returning to the fleet for February, March and April. This is to provide cover whilst the A320 and A321 aircraft are refurbished as well as helping BA meet its obligations to use the Monarch slots at Gatwick it just purchased, but must ‘use or lose’. The Flyertalk post mentioned above also reiterated – as has been said before – that Club Europe catering will receive (another) relaunch in April. Let’s hope it is more successful than the last one, which was seemingly designed by a 50-year old ex-public schoolboy who believed that the modern business traveller jetting in from Milan wants a ploughmans lunch. I am slightly surprised that the crew don’t pass around a jar of pickled eggs. Just to keep it very simple for BA …. Pret had sales of £776m last year. They have already done the market research. If Pret don’t sell it, let’s just assume that no-one wants it and move on …. Something in this article doesn’t make sense. On one hand the cabin crew source says that seating up to row 12 on an A320 and 14 on an A321 will be left as they are (max Club Europe on both aircraft), yet the number of Club seats will be ‘capped’ due to cabin restraints. Well they aren’t reducing the CE Cabin in max size so why would they ‘cap’ the number of seats sold? Meals for longer routes have multiple trays due to starters etc. Only a certain number of trays can fit in a trolley and there is no space for multiple trolleys with the new set up.